BANGI, 26 March 2014 – A good command of English and talent and not just mere academic achievements are the requisites for graduates to secure jobs as well as for their career advancements. 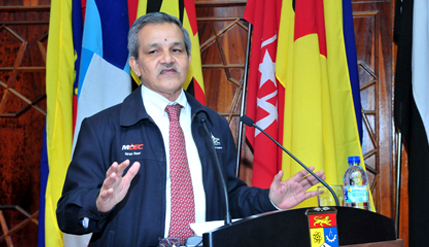 Vice President of Stakeholder Relations of Multimedia Development Corporation (MDec), Haji Niran Noor said graduates seeking employment or needing career progression must be articulate, fluent and quick-witted in both Bahasa Melayu and especially English. Speaking at the opening of The ICT and Communications Seminar (SIKOM) here today, Niran said the ICT industry do not look merely for straight As students but give more emphasis to their talents when choosing to employ someone. The seminar is organised by the Dato Onn Residential College (KDO) of The National University of Malaysia (UKM). MDec is an organisation which directs and oversees Malaysia’s National ICT – Information & Communication Technology – Initiative. Talent is not required in a student’s study schedule or be part of their chosen course of study but an extra credit of personal accomplishments will make a graduate stands out amongst thousands of their peers. These talents or special qualities will differentiate between graduates who are employable and those who are not. “You may have a perfect 4.0 score but do you have talent? What is there that makes you better than your friends? Getting a perfect score for your grades only proves that you are clever, but it doesn’t say you are talented,” Nira said. Among these talents are the talent and proficiency in language like English which will be needed by all graduates when they come in for interviews or to start their careers in major companies. Big companies with global networks deal with many people, countries and languages. The common tongue in the industry, for many of these companies is still English and thus graduates who strive for employment needed to master the language. Describing communication as the key factor in the working world, Nira said that employers search for those who are immensely articulate, fluent and quick-witted. The ability to express oneself to either potential employers or clients makes communication crucial in a student’s arsenal of qualifications. He adds that a graduate having very good communication skill and with talent will secure a good job and career. Companies are scouting universities to find the talents that they need for their companies and they will ‘book’ any student whom they feel has promise. They will also pay for training these students so their skill-set can be polished to be industry ready and able to work and adapt in the company system. “If you have talent and you show potential to them, they will make sure you have a job. It is sad to hear of unemployed graduates but that is how it works, good grades will not take you far, if you have nothing else to offer. Think about it and get yourselves ready for the future, because it’s just around the corner,” Nira said. KDO Principal Assc Prof Dr Jasri bin Jamal attended the event.